Oswego County Federal Credit Union (OCFCU), announced the fourth annual “Gloves with Love” campaign to collect new hats, mittens, gloves, and scarves for needy kids in Oswego County, said Bill Carhart, CEO. OCFCU has again partnered with Exelon Generation at Nine Mile Point to launch the “Gloves with Love” program from December 7, 2018 through January 4, 2019. Collection baskets will be placed at each OCFCU branch as well as numerous locations at Nine Mile Point. Slightly used or new adult hats and winter scarves will also be collected. On Saturday January 5th, 2019, employees from the OCFCU and Nine Mile Point will place the collected items on trees, fences and lampposts in various parks throughout Oswego County. 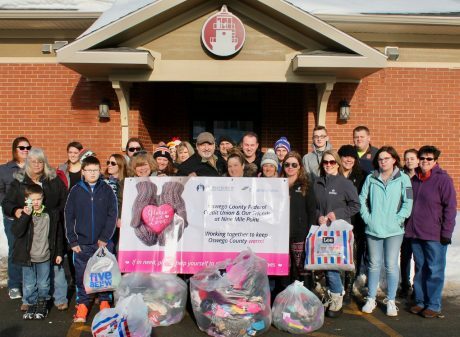 Oswego County Federal Credit Union (OCFCU), announced the fourth annual “Gloves with Love” program to collect new hats, mittens, gloves, and scarves for needy kids in Oswego County, said Bill Carhart, CEO. OCFCU has again partnered with Exelon Generation to launch the “Gloves with Love” program from December 7, 2018 through January 4, 2019. Baskets will be placed at each OCFCU branch and at Nine Mile Point. Slightly used or new adult hats and winter scarves will also be collected. The above photo shows employees from OCFCU and Exelon Generation just before they distributed items from the last Gloves with Love event. For more information, contact Mary Greeney, OCFCU vice president, member services, at 315-343–7822. OCFCU was chartered in 1975 and serves residents and business owners of Oswego County. OCFCU serves over 12,000 members throughout the county and has branches located at 90 East Bridge Street Oswego, 300 West 1st Street Oswego, 707 S. Fourth St., Fulton, and 5828 Scenic Avenue (Rt.3), Mexico. For further information visit www.oswegofcu.org.